Nefertiti (the name is an Egyptian phrase meaning "the beautiful one who has come") was the Great Wife of Akhenaten. If the bust of her found abandoned in the sculptor's studio in Amarna is a true likeness she must indeed have been beautiful enough to deserve such a name. Her origin has been the subject of much speculation. Some have argued that she was one of the foreign women married to, or at least intended for, Amunhotep III; the leading contender in this field would be Tadukhepa, daughter of Tushratta, King of Mitanni. There has never been any evidence to support this, and the discovery that Nefertiti had an Egyptian wet-nurse leaves little doubt that Nefertiti was born in Egypt. Her parents are never identified and, except for a sister, no one has laid a specific claim to being related to her. Tey, the wife of Aye, was Nefertiti's wet-nurse. This, incidentally, was an honorable, not a menial, position and being wet-nurse to a queen would have conferred considerable status. Aye, whose favorite title was "God's Father", was Akhenaten's closest and most trusted adviser. Circumstantial evidence suggests that Aye was the brother of Tiy, Great Wife of Amunhotep III. It is possible that Nefertiti was Aye's daughter by another wife, and that his second wife, Tey, acted as wet-nurse and step-mother to Nefertiti. Most historians today would accept this scenario; the evidence for it is weak, but the evidence for the other possibilities is even weaker. Nefertiti and Akhenaten had six daughters; many family portraits have survived and all are remarkable in their display of affection. There can be no doubt that this was a loving, closely knit family, but all must have mourned the lack of a son to inherit the throne. Throughout the Eighteenth Dynasty royal women played a significant and visible role in state and religious affairs. Nefertiti continued this tradition by actively assisting her husband in his attempt to convert Egypt to monotheism. No look at the life of Nefertiti would be complete without a review of this religious revolution. Like the rest of the ancient world, Egyptians believed in a multiplicity of gods and goddesses. Just as mortals vary in power and status so did the gods. The worship of the ones at the top of the hierarchy was a state affair and largely irrelevant to the common people. Each city had its own deity and then there were a number of minor divine beings who belonged to ordinary people. An individual might feel a greater attachment to one god than to another, but no one questioned the existence of the other gods. It is interesting to note that the religious discrimination and persecution that are so common in monotheistic societies are almost unknown in polytheistic cultures. Akhenaten decided to go against tradition and convert Egypt to a monotheism that would worship Aten, the Sun Disc. Nefertiti was an enthusiastic supporter and a full partner in the process of spreading the new religion. It is clear that the royal couple truly believed in their new faith, but they have left us no further explanation for the move against centuries of polytheism. Akhenaten, Nefertiti and their entire household could have worshipped Aten and spent any amount of wealth doing so without raising a single eyebrow across the country if they had not also closed the temples to the other gods and moved the capital city to a remote corner of the land. Why did they do it? The Theban god Amun had been the recipient of so many gifts in the Eighteenth Dynasty that the Amun priesthood was the country's largest landowner. It is possible that Akhenaten feared the rise of a parallel government that could threaten the monarchy, but in that case why move the state administrative machine to a remote corner where it would lose touch with the rest of the country. We may never know the real reason: it is possible that Akhenaten and Nefertiti were motivated by nothing more than a belief in a single God and a determination to make His worship the official religion of Egypt. While statues of gods were worshipped, the Egyptians thought of the statue (we would use the term idol) as a representation, not the actual deity---a modern parallel might lie in the reverence shown by some Christians to the crucifix or altar in a church. The Egyptians were also prepared to accept that gods could be combined; that is, two deities such as Re and Horakhty, might actually be manifestations of a single god, Re-Horakhty. Akhenaten and Nefertiti took this to its logical extreme and concluded that there was only one God and that He was a universal God for all the people of the world. This happened a century before the time of Moses and early historians tended to see Atenism as a pre-cursor of Judaism and Christianity and to view Akhenaten and Nefertiti as great prophets. Disillusionment grew along with our knowledge of the true nature of Atenism. Aten showered humanity with gifts, but the only way to approach this God was through Akhenaten and he was almost inaccessible in his capital city of Amarna. As taught by the royal couple, Atenism was largely irrelevant to the common people and the temples to other gods were closed. Workers were sent to erase the name of Amun wherever it appeared. Akhenaten appeared to lose interest and authority in the empire and even in the country at large. Nefertiti was a full partner in this religious reformation; she is pictured worshipping alongside her husband and on other state occasions. She was never given the title God's Wife of Amun but she appears to have performed all of the functions normally associated with that office. She was pictured killing the enemies of Egypt in a scene normally reserved for pharaohs and she was shown with her husband awarding gold to royal favorites at the Window of Appearance. By Year 14 of Akhenaten's reign Nefertiti had disappeared from view yet there is no record of her death nor has her mummy or place of burial been found. This has led to considerable speculation as to what happened. Some have suggested that the royal couple had a falling out and Nefertiti was banished in disgrace to her palace, Aten's Castle. Others are quite convinced that Nefertiti changed her name to Smenkhkare, adopted the guise of a man and ruled as co-regent with her husband. The majority view is that Nefertiti died of natural causes (possibly the plague) as a great and honored queen. For more detail on this speculation click here. Akhenaten died about Year 17 under circumstances just as mysterious. There is no reason to believe he died of anything but natural causes, but the record says nothing and his mummy has not been found. Smenkhkare appears to have been co-regent for three years and to have died either just before or just after Akhenaten. Tutankhamun inherited the throne next and in his reign Egypt began the process of restoring the old religion. The experiment in monotheism had been a dismal failure. 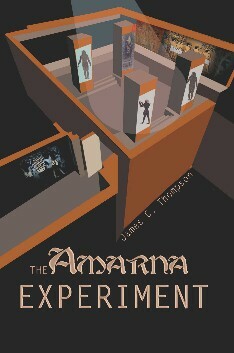 The author of this website has published The Amarna Experiment, a novel set in the age of Akhenaten and Nefertiti.